NOW A TRUE DELTA-T ECM HYDRONIC (FHW) HEATING APPLIANCE! Hydronic (FHW) heating system installations can be likened to creating something with a giant Erector Set™. As a kid, mine came with an electric motor enabling powered cars, airplanes, ferris wheels, etc. Days, weeks and months of childhood imagination and expression ensued. Great memories! Now as “big kids” hydronic heating system installations offer us a similar fulfillment of free expression. Within the limits of ultimate system functionality hydronic “artists” can seemingly paint their own canvas while getting paid for it! The question logically arises however as to where are the cost benefits of our efforts? We argue that heating guys are indeed losing direction, both technically and functionally. The adage “Old Dogs need to learn New Tricks” comes immediately to mind, regretfully also being one. It’s not only our innate trade resistance to change but not to think forward in applying what has preceded us ….. beginning with Physics 101! Gravity convection was the means of distributing heating water from the Roman Age onward. From the mid-1800’s to about 1930 it was “Queen” Gravity Hot Water along with “King” Steam. However gravity hot water systems required large boilers, piping and radiation sizes. They were slow to react, single-zoned and fuel hungry, whether burning wool, coal, oil or whatever. Introduction of the electric circulating pump changed hot water (hydronic) heating forever. Now multiple zones, rapid response through less intrusive radiation and powered burners do it all very conveniently. Gravity is still there, but we have necessarily learned to control it with flow check valves. Apart from the brief and unsuccessful introduction by American Standard of their “Ash Can” Gravity Boiler System in the late 1950’s (our nickname – we were Am-Std Installers back then) FHW has predominated. Circulators began by being placed on the (cooler) returns with flow checks on the (warmer) supplies to control convection. Then circulators moved to the supplies along with the valves. Boilers are now migrating from two-pass to three-pass or condensing types for greater efficiency. That’s arguably been it ….. until now! Enter the Delta-T (differential temperature) sensing and managing, ECM (electronic commutator motor) driven Variable Speed Circulator, specifically the Taco® VT2218-HY1-FC1A01 (Current Model). This latest iteration in Taco® Hydronic Distribution Technology is making its inevitable mark on radiant and other hydronic circuits. Its “smart” capabilities are many however, having five (5) selectable operating modes, but we are focused only upon the “DELTA-T MODE” within its appetizing menu. Quite a mouthful indeed, but place the emphasis on APPLIANCE. You see, delta-t hydronic technology is not merely a “circulator swap” for radiation and energy efficiency gains. It offers additional opportunities in hydronic process integration and management as yet either unrecognized or underutilized. Our efforts fall on the latter, particularly when cooperating with “Mother Nature” by employing natural hydronic (gravity) convection to an operational advantage. Falling back upon and employing the principles of “non-powered” gravity heating we optimized a “contemporary” Delta-T ECM FHW System. Utilizing supply and return iron-piping “stacks” and compacted manifolding minimized distribution head losses. Combine these with the thermal storage capacity of mating to a cast-iron high-mass boiler enables a true, free-standing APPLIANCE. Its profile is contained within the boiler footprint plus about a foot of exhausting & piping space to the rear. Modular construction is a natural for hydronic elements as well as system wiring and controls. Module variations to suit particular site and application requirements logically follow. Taco® promotes energy reductions of up to 85% and 15% for electricity and fuel respectively by using their Delta-T ECM Circulator Product. We emphatically agree ….. and even more! Measurements on our multiple “Beta Sites” indicated a deviation that was not anticipated. Namely, upon the dedicated VT2218 system circulator achieving preset “delta-t” and stabilizing, the wattage displayed further deteriorated to approximately half this value along with some further speed reduction! A subsequent “Beta Site” circulator failure confirmed our suspicions. First, that failure event was not noticed for an estimated 2-3 days, and then only with a gradual decay in house temperature. The event was camouflaged by an integral Indirect Water Heater (IWH) based domestic hot water (DHW) delivery that was never affected! The circulator failure not only quantified the now measurable convection (gravity) heating effect witnessed, but qualified our overall near-boiler piping configuration, purposely designed with a de facto priority circuit for the IWH Option. The latter eliminates the need for that particular optional control feature. Further witnessed on our “Beta” circulator failure was boiler temperature operating near maximum. TheHydrolevel® 3250-Plus Aquastat on our Weil-McLain® UO Boilerlogically incremented system temperature upward, attempting to satisfy prolonged zone demand(s). The higher supply/return temperatures and differentials further enhanced convection. The effective 700 pound plus thermal storage mass of our “appliance” also served to dampen the close-coupled IWH zone demands! It is reasonable to presume that the IWH thermal storage would also be “pumped down” during a burner failure, passively prolonging thermal decay. Complimenting hydronic performance is our “Compact Steel Hydronic Header” (Patents Pending) that positions, orients and provides flexibility in both zone and return valve mounting with expansion capability. Placing Taco® Zone Sentries at their minimum (2-3/4″) spacing with wired harnessing eliminates the need of a significant valve or circulator relay expense ….. and with greater diagnostic and system functionality! Currently applying our manufacturing process expertise we are projecting the “economies of scale” provided in our construction. The physical modules of boiler, supply and return are configured for capacity/fuel and zone complement and inventoried. A natural and complimentary option of an Indirect Water Heater (IWH) for domestic hot water (DHW) generation falls into this methodology as well. Adding assembly fixtures, applied tools, wiring assy’s, etc. further contribute to appliance value. A Hydronic Heating “Appliance” changes everything. The historical loose-piece “process” of hydronic (FHW) installation now becomes a “product” installation of lesser content with higher, predictable system performance and costs. Not just having a stock product that readily configures to the specific requirement, but being available on demand to fulfill both routine and seasonal emergency failures is a valuable resource indeed. Appliance costs and performance are also guaranteed, with all components warranted by their U.S. Manufacturer(s) as with any contemporary installation. Our motto:“Simple, Durable and Efficient FHW Heating ….. Period!”sums it all up. Technology has finally caught up with hydronic heating, and it’s about time! The end game after all is providing real value to the consumer, is it not? SIMPLE, DURABLE, EFFICIENT FHW HEATING ….. PERIOD! Our Motto is“Simple, Durable, Efficient FHW Heating ….. Period!”. Boilers On Demand LLChas achieved this seemingly noble objective by fully integrating Advanced Taco Delta-T ECM Hydronic Distribution Technology into Forced Hot Water (FHW) Heating . 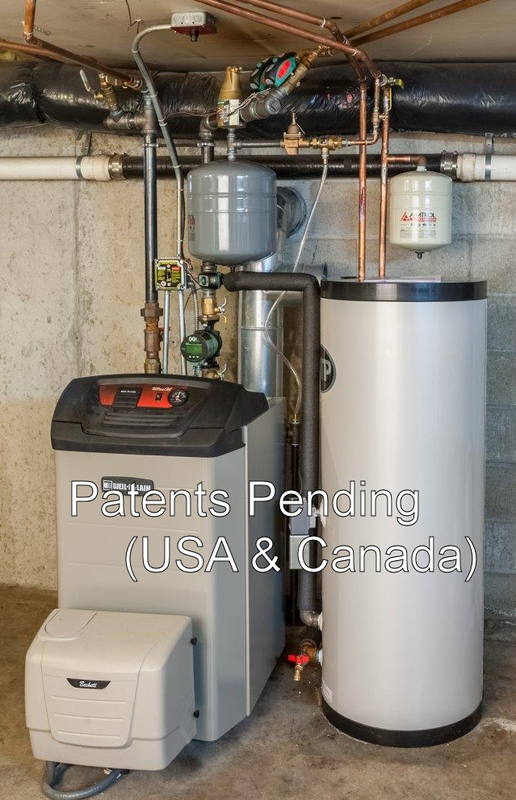 The unstated result of our“Convection Enhanced Delta-T ECM Hydronic Heating Appliance” (Patents Pending – USA & Canada)development is it being highly cost-effective as well. Can we “have it all”, so to speak? Let’s look at our effort in further detail …..
Hydronic (FHW) Heating to the layman and consumer has always had a certain mystique, evidenced by witnessing a tradesman or plumber configuring a system, piece-by-piece into a seeming maze of piping and components. The results vary from the mundane to aesthetically impressive, but we must realistically note in fact that the hydronic performance of any system is less than ideal. The residential and light commercial heating markets in particular have not had the tools nor the general expertise to optimize a hydronic heating installation. Consequently the end user has suffered with an over-installed, under-performing, energy-consumptive system over its lifetime ….. knowingly or not! Note: We can’t excuse our like personal participation for now sixty (60) years in hydronic heating. Our guilt is shared ….. but no longer! Now a true “hydronic revolution” is upon us, not yet generally known and even less appreciated, nor applied. Hydronics have thankfully been somewhat forgiving to all of us applying it, but now there’s a new day, and a new benchmark. A Hydronic Boiler to create energy by burning a fuel, as efficiently as possible. Moving (distributing) heated water to points of use with “pipes and pumps” (circulators). Warming an environment by passing air over hot piping, as simply and effectively as possible. We have progressed quite well in creating and utilizing energy via boilers and radiation, but that is where it has stagnated far too long. Given the limitations of fixed or selectable speed circulators and valving we have managed without addressing the true potential of improving hydronic distribution efficiency to complete the heating equation. The intelligent, variable speedDelta-T (ΔT) ECM VT2218 00e Series Circulatorby Taco Comfort Solutions® has changed it all ….. and none too soon! We have been experimenting with Taco® Variable Speed Delta-T VDT’s, “BumbleBees”, Viridians and now 00eSiries ECM Circulators for years, utilizing them as direct substitutes for their fixed-speed predecessors. They have worked particularly well as radiant zone circulators as our fellow tradesmen have also discovered. The Taco BumbleBee® in particular has gained trade notoriety both by its appearance and performance. However, our personal technical efforts have gone well beyond the obvious in pursuing a dedicated boiler system circulator application. It has neither been promoted nor seeming anticipated, yet its implications are very significant when achieved. First and foremost is reliability! A dedicated (single) system circulator failure is a potential “show-stopper” after all. Performance Flexibility. It must adapt to and accommodate all system energy demand patterns with minimal, if any effect. Accommodate an Indirect Water Heater as a prioritized and an incrementally higher energy demand accessory. Significantly improve system efficiency and performance while reducing energy requirements, both fuel and electric. Zone Valves are a necessary compliment to manage individual zone demands when using a single circulator. New generation valving and in particular the Taco Zone Sentry® Valve provide outstanding performance and value with self-diagnostics. The “Zone Sentry” in fact delivers three times the heating capacity of its popular “Heat Motor” predecessor, and uses dramatically less power. Combine these with its physical packaging attributes the “Zone Sentry” provides a unique configuration opportunity further addressed in this writing. “Near-boiler piping” as generally referred includes circulators, valves, air elimination and expansion devices that prepare and present heated water or “hydronic energy” to points-of-use. Distribution piping that extends and presents this heated water energy to radiation components. We offer that considering these two distribution tasks without differentiation or distinction is fundamentally flawed, and yet is standard trade practice. As initially stated, Delta-T Distribution Technology changes this assumption, and dramatically! Consolidating hydronic flow within a single, intelligent system level circulator packaged with complimentary, intelligent zone valves packages into a true, efficient FHW Heating Appliance. Further, “hydronic convection” (gravity heating), the natural attribute of heated water to rise and convect within distribution piping is idealized as well. Witness the need to install “flow-check” valves in conventional systems piping, into circulators or using properly sited zone valves to control convection (gravity) heating. By incorporating natural convection total circulation energy is measurably reduced beyond that of Delta-T. A simple analogy would be “like paddling your canoe with the current, rather than against it”. Hydronic convection performance is at the core of our Proprietary Near Boiler Piping System. Included as a standard, recommended option for idealized system and DHW (domestic hot water) creation efficiency is an Indirect Water Heater(the HTP SuperStor Ultra Series). Close-coupled within our near-boiler piping, its integrated supply architecture becomes a physical, gravity flowing extension of boiler capacity, particularly in circulator fail-mode operation. Yes, we had a “fluke” 1st Generation Taco Viridian® VT2218 failure on our “Beta #3” site that was not discovered for an estimated 2-3 days of heating operation. DHW generation was never affected! Ideally complimenting our hydronic system is the highest-mass boiler for its rated output (the Weil-McLain UO Series), extending system energy storage capacity and potential fail-mode convection performance. Its supply and return rear porting compliment near-boiler piping by compactly and efficiently packaging all hydronics within its footprint plus an approximate 1 ft. rear piping and exhausting space. Adding the Indirect Water Heater uses under 12 sq. ft. of combined space, up to 2/3 less than a typical currently installed system while reducing system valving and near-boiler piping by up to 1/2. Integrating with domestic all-steel piping, malleable fittings and brass/bronze valving compose a free-standing system architecture of innately superb strength, chemical resistance and field proven longevity. Now applying our paralleled “High-Tech” Manufacturing Process expertise to Hydronic Heating, we have modularized, value engineered, methodized and tooled our Delta-T ECM Hydronic Heating Appliance to include several additional components in our Intellectual Property Protection (Patent Pending) Submission. Our cooperating customers on multiple “Beta Sites” are also providing us valuable data to optimize our system design and performance with the goal of providing an unbeatable cost-performance product. Taco Comfort Solutions® publishes that its Delta-T ECM VT2218 00e Series Circulator provides up to 15% fuel and 85% electrical power reductions in applications. We certainly concur! Our dedicated VT2218 system circulators are using 8-13 Watts in heating maintenance mode. Cold system warmups begin at 25-35 Watts (half the rated power) then reducing toward acclimation temperatures. Additionally by using the High-Mass Weil-McLain UO Series (Oil) Boiler(s) we see system operating temperatures lowering to 132-140º F, regulated by its integralHydrolevel “Fuel Smart” HydroStat® 3250-Plus Aquastat. System demands are readily “cushioned” by the thermal mass provided in the total system architecture. It responded very positively to the prior noted prototype system circulator failure, ramping up system temperature toward maximum with zone duty cycle duration detection & response, maintaining radiation heating in degree. Boiler burner cycles are infrequent and brief, further reducing equipment maintenance levels while extending system operating life. We have more recently offered the appliance-specific Carlin EZ-PRO Gas (NG&LP) vs. the Beckett NX Oil Burner in the Weil-McLain UO Boiler. Now it’s a Universal Hydronic (FHW) Heating Appliance! Change fuels ….. swap the burner only! Total Hydronic (FHW) Heating System Efficiency is the AGGREGATE of Boiler AFUE, Delta-T ECM Hydronic Distribution & Radiation Efficiency Gains! We further claim that the reduced operating system temperatures and hence stand-by losses of the very high mass Weil-McLain UO Boiler further increase overall efficiency. Thus we can confidently claim the highest efficiency heating system available! Taco® Delta-T ECM Hydronic Distribution changes everything! The “Plumber’s Playground” of conventional, inefficient hydronic distribution piping “free expression” is gone as well! We must now look at Hydronic (FHW) Heating in totality, no longer as a an aggregation and assemblage of parts by personal preference. Technology has provided we heating guys with some new working tools. Let’s learn how to use and apply them well!